Plant with short stem, completely enclosed by imbricating leaf-sheaths. Roots many, fleshy, flexuous, flattened, long (up to one meter), at tips green olive or yellow green with brown spots. Leaves fleshy, numerous (3 to 7), length and width variable (26/36 cm, 8/13,5 cm), oblong-elliptic or oblong-lanceolate, obtuse or rounded, dark green marbled of silver/gray, purplished below. Flower stalk thin, pendent, branched, long(1,20 m.), being able to carry more than 100 flowers, opening simultaneously in a very short time. Bracts triangular, discrete, of 8 mm. 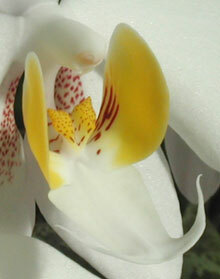 Flower showy with delicate texture, variable in size (6,5 to 9 cm), and in form. Sepal dorsal elliptic or ovate-elliptic, obtuse or round. Lateral sepals obliquely ovate, acute or obtuse. Petals rhomboid, obtuse or rounded. Lip 3-lobed, shorter than the segments, pedicellate. Lateral lobes reniform at cuneate base, erect, not surrounding completely the column. 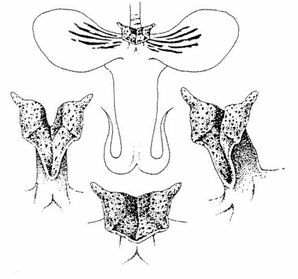 Midlobe sessile, concave or flattened, sagittate-hastate with acute or obtuse more or less marked auricles at lower part, gradually narrowed towards the top where it is divided into two appendices acute and bent anchore-shaped with stock lengthened. At junction of pedicel and lateral lobes an almost square callus, bilobate, deeply notched out in form of V, truncated, with at apex, two appendices horn-shaped projected towards the outside on each side of V.
At the former base of callus and at the junction of lateral lobes, one can observe a small depression in the shape of V reversed. Column of 8 mm, fleshy, cylindrical. Pedicellate ovary from 3 to 5 cm long. Sepals and petals white, sometimes with pink sufusion, more particularly towards the base of the segments. Lateral sepals denselly spotted of carmine in their lower half. Lateral lobes of lip yellow with 4 to 6 convergent carmine strippes on the lower half. Some rare clones have the lateral lobes green apple. Pure white midlobe. Yellow gold Callus or orange yellow, delicately dotted carmine spots. The pedicel is marked with carmine spots. The maximum of flowering is observed October at April but extends to all the year in nature. The first floral poles produced by the plant are short, then their size increases with the age of the plant. The flowers open out almost simultaneously. This species is in colonies on the main branches of the trees in the moderate-cold part of the Sierra Madre in the same area that Phalaenopsis lindenii. 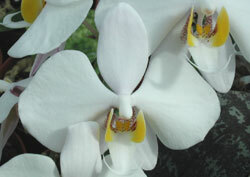 Species introduced at the beginning of the Sixties and a long time considered as Phalaenopsis leucorrhoda (hybrid natural of Phalaenopsis Aphrodite and Phalaenopsis schilleriana). Described in English for the first time in 1984, this species was officially recognized only in 1987 when description (diagnosis) could appear in Latin.